This week we have a review & giveaway of To Kill a Kettle Witch. Details at the end of this post on how to enter to win a copy of the book, along with a link to purchase the book from Amazon. Celine and Amelie are Mist-Torn Witches, sisters with paired powers. Hold Celine’s hand and she can see into your future. Holding Amelie’s hand reveals your past. If their stories were made into a movie, the theme song should be the Beatles’ “I Want to Hold Your Hand.” Celine runs an apothecary and herb shop under the protection of Prince Anton, who is sweet on Celine and uses the psychic siblings to solve mysteries. Amelie is a trained fighter who likes to wear pants, but Anton keeps sending her on detecting quests where she has to dress like a lady. When a castle worker who is a semi-distant relation tells them that relatives they never knew are in trouble, off they go to another land in To Kill a Kettle Witch by Barb Hendee. Prince Malcolm’s fields have been cursed, and he won’t let the gypsy-like Móndyalítko leave their harvest camp, even though there is nothing to harvest. He suspects the traveling workers and keeps them there until he can catch the curser. Accompanied by a shape-changing Móndyalítko, who pines for Celine, and guided by Anton’s most-trusted lieutenant, who Amelie tries to resist because of his non-monogamous reputation, the Mist-Torn sisters arrive with the castle servant and meet their late mother’s family, using their powers to verify if the clans are guilty or innocent of the crime. It’s a fantasy-mystery novel with paranormal rising with the male companions seeking clues along with the sisters. The women uncover many dirty little secrets of the encampment and the castle, and they find themselves in many forms of danger, including unwanted suitors and suitors they might want. Barb Hendee is known for the Noble Dead series she wrote with her husband, J. C. Hendee. I am fondest of her solo work and its lean, spare style, where flashbacks move the action forward instead of bringing it to a stop. 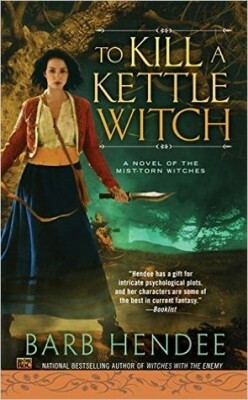 To enter to win a copy of To Kill a Kettle Witch, simply email KRL at krlcontests@gmail[dot]com by replacing the [dot] with a period, and with the subject line “kettl,” or comment on this article. A winner will be chosen May 28 , 2016. U.S. residents only. If entering via email please include your mailing address. I have started reading more witchy paranormal books, and this fits that bill. I have to seek out this series and join in the adventure! Thanks, Terrance! Thanks, KRL! I would love to win this! lindaherold999@gmail.com Thanks for the chance!! This sounds like an amazing and interesting read. An apothecary shop and herb shop and the special powers of the sisters is sure to be a great read. Definitely adding to my TBR list. Sounds interesting! Thanks for the giveaway!